When I started The POSH Organization a few years ago, I had been ready to leave corporate America. My story is much like that of many other female entrepreneurs. Women who are ready to not just break but remove the glass ceiling and have more control over their schedule and time. More and more women – up 114 percent from 20 years ago (source: Inc.) – are starting their own business and joining the ranks of male entrepreneurs. I think this is an exciting trend and am personally thrilled to see so many women being empowered in their businesses and being able to carve out their own niche in the business world. Small Biz Trends shared some statistics on female ran businesses last year and reported that women (47 percent) are more likely than men (44 percent) to start their own business. Women tend to launch businesses in healthcare and education, and according to Small Biz trends, expected to see an increase in their revenues last year. This doesn’t mean there are not hurdles and challenge for women entrepreneurs. Even though there have been some exciting gains for women business owners, women still find themselves dealing with some big issues. Financial stability is one area women business owners struggle with and one that will normally cause them to want to return to the corporate world. The reason so many women struggle with this is they do not feel justified in charging what they are worth. We have been underpaid for so long it is hard to break that mold when in our own business. Another struggle is the lack of mentors. Men often have other males to call on for advice and to help them in their business; women often don’t. Even though the numbers of female entrepreneurs have increased, there is still not many women business owners to lend support close by. The third challenge is female entrepreneurs often find it hard to get a proper work-life balance. Sometimes, women entrepreneurs find they not only have a family and children to take care of, but they have to take care of their business as well. This can create a feeling of less time and their business may begin to suffer. In order to have the true freedom that female entrepreneurs crave, hiring a VA may be a great way to delegate tasks and have someone free up your schedule for a few hours a week. The money invested in your company in hours that you can be really focused on growing your business equals a good business decision! If you would like to find out how a VA can help you grow, please feel free to reach out to me! Can I Really Trust a VA to Get My Work Done? I completely understand where the question comes from – many of us still think in terms of our former corporate lives, where we had to go in to an office, punch a time clock, and usually eat lunch at our desk. Working in an office meant employees had to be there on time and limit any personal time. It felt highly structured and scheduled, right? So how does this work if you are using a VA? Do remote workers get the same results as those employees sitting in a cubicle? In some ways, VA’s or remote workers can be more productive than traditional employees. Time management: VAs can plan their work around their schedule (picking up kids at school, running errands, etc.) so there is less time off taken. There is also a decrease in sick leave when they or their child is sick. By being able to work from home, they can respond to emails, phone calls, etc. from the comfort of their home instead of taking a day off. Less interruptions: Unlike employees who work in the office, VAs are normally hyper protective of their time. By cutting down on unnecessary trips to the break room or the snack machine, remote employees are able to get more work done. Better communicators: VAs normally have to rely on email, chats, text, and Skype to communicate with their team members as well as Clients. By having strong communication skills, remote workers know how to ask for clear expectations and deadlines and know how to follow up properly. Typically, remote employees are able to do everything a traditional employee can do and are often a more cost-effective option to help entrepreneurs and small business owners expand. If you have been thinking about hiring a VA but aren’t sure what you need, feel free to contact me for more information! As an entrepreneur, you know how important getting clients can be. It is the lifeblood of most businesses. It’s why you have your social media channels and other marketing in the first place. You may have everything you need to help direct traffic to your website, but if you don’t have the time to follow up, you may be losing out on business and failing to reach clients and customers that are interested in what you have to offer. That’s where a virtual assistant (VA) can come in! A virtual assistant can handle most of the essential follow-up tasks that will help you land clients and customers. Hiring a VA is essentially like having your own personal customer service department. Depending on how many hours you need them to work, a VA can respond to emails, answer questions on your social media channels, and follow up with potential clients. A VA can also create a follow-up calendar entry to know when to reach back out with potential clients and then be able to at the appointed time. Have a client that needs services at certain times of the year? The calendar can also be updated with important dates significant to your specific client, so your VA can reach out to them well in advance. Having a VA follow-up can also establish rapport between customers and your business. Nothing feels more frustrating than filling out a contact form on a website, requesting information and not receive a response for a week. Your VA can respond within a certain time frame, making the customer feel valued and heard. With business being online and practically 24/7, hiring a VA to follow-up with your customers will ensure your organization is making – and keeping – your clients as a priority. Not sure if your business needs a VA to follow up with potential clients? Contact The Posh Organization for a complimentary discovery call! Being an entrepreneur can be one of the most rewarding careers out there. It is also one of the most challenging, as you often find yourself wearing many hats. Depending on your business, you may find yourself acting as CEO as well as the marketing director, content writer, and customer service rep, all in the same day. It’s a lot to juggle, isn’t it? And, when you have so many things to do, it can be hard to focus on one thing. Something inevitably will get neglected. One of the biggest misconceptions I have encountered is the idea we have to do it all in order to be a successful entrepreneur. The most successful individuals are those who know how to focus on what they do best and delegate the rest. ​You wouldn’t dream of trying to repair your car if you weren’t a mechanic or savvy about cars, would you? No, you’d take it to a mechanic. But how do you delegate when you are a one-woman (or man) show? That’s where hiring a Virtual Assistant can really help increase your productivity. And when you increase your productivity, you can be closer to meeting your business’ goals. According to a 2018 Forbes article, businesses lose over $75 billion dollars because of poor customer service, something that many entrepreneurs just cannot afford to lose. Hiring a VA to handle all of your customer service tasks can free up a tremendous amount of time – and allow your customers to feel like they are valued and appreciated. Creating images for your social media account as well as managing those platforms can take a great deal of time, but not everyone knows how to create graphics; nor do entrepreneurs have the time to spend on these platforms. A VA can save you valuable hours each week by managing these accounts! Virtual assistants can even help you process potential leads or do some research for you. It all depends on what your specific needs are and what you need them to help you do. By hiring a VA to help you perform these duties, you can spend the time on aspects of your business that only you can do – meeting with clients, closing deals, and thinking of how you want to expand your business. The key is freeing up valuable time to help you do what you do best and that is grow your business. Please feel free to reach out to me to see how hiring a VA can help you be more productive and how TPO can help! ​As a business owner or start-up, it’s common to do everything on your own. Controlling every aspect of your business after all in why you are in business in the first place. But now all the small administrative tasks aren't so small anymore and it's time you get help. Investing in a virtual assistant (VA) can significantly reduce the amount of hours spent working in your business. If you are an entrepreneur, then you know the difference between working in vs. on your business. But let's face it, determining which tasks are the best to delegate can be complex. Whether you are starting or growing a business your customer and or clients are important to your very existence. Exclusive customers and clients have built trust in your product and services and this is something that you do not want to jeopardized. It can be hard being a Jack or Jane of all trades, but it is important to know when you need help. It may seem counter-intuitive to spend money on tasks that you can do yourself. But what about the tasks that you aren't so good at? Even more, the daily required administrative business tasks are robbing you of your time and not allowing you to be as creative as you could. Hiring a virtual assistant to take care of the mundane administrative tasks that your business requires is the best way to propel your business and take back the time you need to grow. If you are curious about some of the most popular tasks to outsource to a virtual assistant, here are the top requests from our current Clients. These tasks are essential,, and bet's are you need a bit of help in these areas of your business as well. Manage your Calendar - Your VA can book events and meetings, and facilitate reminders. Finally, avoid overbooking ! Email management - Your VA can draft correspondences and follow-ups, organize your email, and create e-blasts, and email templates. Invoicing - Your VA can help you to manage business invoicing, send reminder correspondences, and keep up with other bookkeeping services. Social Media - Your VA can create graphics and content, develop and research hashtags, engage with your followers, and post during peak time. Content Creation - Your VA can help by creating website copy, marketing materials, blog writing, and a host of other creative writing needs. Research - Your VA can keep up with industry trends by staying ahead and completing market research. Concierge services - Your VA can scheduled travel arrangements, perform on-sight social media execute business-related errands and more. Project Management - Your VA can be tasked to completely manage a project from inception to thank you's. When it comes to the daily administrative and marketing tasks, there is a good chance that a virtual assistant can get it done more efficiently than you. Delegation is essential for growth. How do You Set Business Boundaries? With a new baby, 6 year old, husband and household, it is extremely important to set limits and stick to it with your clients, friends, and even your family if you want to make working from home work for you. Otherwise, you will be pulled in all sorts of directions. Let me tell you... I know. And I am failing miserably. Business is booming, but other areas of life are being sacrificed. In a perfect world...The office is not a family space and your family room is not the place for business. Setting physical boundaries can get into the right mindset when you go from one area in your home to another. Home office #Mompreneurs how do you set limitations and boundaries in your business? The Benefits of Adding a Virtual Assistant to your Team! Let me ask you this…as your business continues to grow, have you noticed that you are faced with a workload that you just no longer stay in front of? At the end of the day, you think: “How can I continue to manage at this rate all on my own?” If you take the time to analyze this situation, you’ve probably come to the conclusion that it’s time to hire somebody - anybody!! So, what is the best option for you? Increase your income and grow your business, by investing in the staff to support you. Continue reading to discover 9 benefits to hiring a Virtual Assistant. You cannot work on all business tasks yourself without affecting quality assurance of your products or services. Having an extra hand to manage projects is essential to the growth of your business. Consider this…do you find that businesses be it big or small “seem” to be more legitimate because they have employees? Much like the secure website symbol that you see when you visit a website, customers want to feel confident in the companies that they give their business to. Even a sole-proprietor working from home is considered a small business. So it's important for small businesses to consider ways to further legitimize their company. Psychologically, businesses with multiple associates seem to be doing "real" business over those start-ups with 1 task-master. Collaboration is a powerful tool that will allow your business to level up. Your business can flourish with strategic partnerships and shared interests from staff. When trying to expand your business, bring the talent of professional VA’s into your strategic process. Take the time to help your virtual assistant understand your business brand, culture, ethics, policies, expectations and allow him or her to share their ideas. Virtual Assistants are vested professionals who often time only take on projects and or businesses where they can provide services and support that they enjoy and love. Relationship building is of primary importance as well. Find a virtual assistant that you feel comfortable with. Someone that you like, and could consider hanging out with. (You will certainly get to know one another very very well over time.) In due time, you will get to see a substantial growth in production and productivity. While hiring a VA, is still novice to some, boundaries of past are no longer a factor because so many talented VA’s are available right here in the US. Geographical location, language barriers, time constraints, cultural differences, and connectivity capabilities, were often found to be some of the cons of hiring an International VA. Simply stated, in the technological era that we are in, find access to local and world-class talent with just a few clicks on your keyboard. TPO would recommend using this as an opportunity by contributing to society and by recognizing the authentic talent within your own community. Options become available at comparatively lower costs, and you will quickly wonder how you were ever able to manage without your VA.
Be wise. Make financially sound business investments. Many solopreneurs and entrepreneurs find it hard to keep up with their expenses. While outsourcing may just sound like another business expense, it’s one that will prove to have exponential ROI. Hiring an in-house staff member, costs considerably more than that of a Virtual Assistant. Conversely the use your virtual assistant will cut down on operational expenditures. By hiring a virtual assistant, you can save on expenses like securing an office space, health benefits and insurance, employee tax, training, software, office equipment and furniture, utilities, internet and more. Depending on your current need, a virtual assistant can provide support on a part-time, full-time or as needed basis. As a business owner, important tasks can get overshadowed by a jam-packed schedule. In such circumstances, a virtual assistant can focus on crucial tasks like email communication, social media, calendar management, invoicing, content creation, graphic design, customer relations management and more. Having a virtual assistant on your team allows you to have more time to focus on monetizing your business and tasks that require your direct attention. By offloading your businesses mundane tasks, a virtual assistant will add more productive hours to your business day. Could you imagine more time to spend with friends and family to unwind, read, research or brainstorm new services or product ideas? Business does not have to stop because you are away. In the contemporary market, entrepreneurs are gradually realizing the importance of delegating tasks to VA’s. In order to grow, the best use of limited time must be achieved. Virtual Assistants are professionals skilled in multiple areas. Known for decreasing your work-related stress, they can help you keep your business and calendar organized, while making sure that daily tasks get completed within a stipulated time frame. - Things you can’t do yourself. - Things you shouldn’t be doing. - Things you can delegate. - Things you don’t have experience doing. Once you have developed a list for the categories above, prioritize and begin the conversation with a potential VA. By delegating tasks to a VA you can focus on core business operations. In a modern society where business seems to never close, being available to customers for limited hours is leaving money and relationships on the table. A Virtual Assistant’s support can extend your business hours while widening your market reach and keeping you ahead of your competitors. So, how can you increase your business hours? By hiring a virtual assistant from a different time zone or specifying that your VA be available during your hours of closure, you can offer extended hours to your customers. VA’s are also available to support you during after "business" hours, personal vacations, business trips, and during official holidays! Virtual assistants will bill you only for the hours that they have work. If you hire a VA, you don’t need to think of paying for sick days, vacation days or health insurance. This can save a great deal of money while providing you with valuable services to operate your business methodically. But remain realistic about the time it will take your VA to complete the services as required. If it takes you 5 hours, it most likely will take your VA the same amount of time. Entrepreneurs like to be in control. You are used to assuming all the required rolls in your business, but you do not know it all. Surely there are some areas that you know nothing about or that you prefer not to attempt. With virtual assistants, you can make up for the skill gap in your organization. Providing you a pipeline of extra skills, a VA can accomplish various tasks on your behalf without having to pay costly expenses for training and software. Virtual Assistants are committed to providing services that result in increased production while delivering quality and value to their clients. They are well aware of the fact that your business revenue depends on the positive execution of the tasks that they are responsible for. Their reputation and business success depend on how invaluable they are to you and your business. Having a vested interest in providing extraordinary services, VA’s constantly seek to learn new skills and to provide HIGH-QUALITY services. At times, these assistants perform at a higher level than the conventional full-time employees because their business and contract depend on it. Finding the right Virtual Assistant for you will completely change that way that you manage your business. Feel free to contact The Posh Organization for a free discovery call. Many businesses face the need for financing at some point during their lifecycle, but the reasons and options for doing so vary greatly from company to company. Businesses that seek out funding for a large project or a fixed major expense may benefit from a business loan, as it provides a one-time amount with a predictable repayment term. However, some businesses may find the flexibility of a business credit line optimal for their ongoing financing needs. Before applying for one versus the other, it’s helpful for business owners to understand what a business line of credit is, how to get one, and the options for borrowing via a line of credit. What is a Business Line of Credit?A business line of credit can be compared to a personal credit line, where a lender offers flexible access to funds on an ongoing basis. A business line of credit has a stated credit line maximum that businesses can borrow against and pay back over time. As a revolving account, similar to a credit card, there is no set monthly payment for some credit lines. Instead, there’s a minimum payment of principal, interest, or a combination of the two based on the amount borrowed. As payments are made on the outstanding balance, the available credit increases up to the stated maximum. A business line of credit works best for businesses that are in need of flexible, ongoing access to financing. For example, a business owner may use a business credit line for funding payroll or overhead expenses during a seasonal slump, or for a major expense that comes out of the blue. Unlike a loan that offers a fixed lump sum amount and steady repayment over a set number of months or years, a business line of credit allows business owners to just use the funding they need – and when they need it. Although the flexibility is helpful, business lines of credit can be more expensive in terms of the interest rate than traditional fixed loans. Business owners with a large credit line may also run into trouble if they borrow too much and only make minimum payments over time. How to Get a Business Line of CreditCompared to small business loans, a business line of credit is easier to qualify for, and it often does not require collateral like a building or equipment to secure the credit line. However, business owners must still submit an application to a lender that details the business revenue, time in operation, and assets on hand to get approval. The stronger the business and in some cases, personal financial data and credit history, the higher the probability of getting approved for a new business line of credit. It is important to recognize that business lines of credit have higher interest rates than business loans, which helps offset some of the risk lenders take on in granting approvals to a business with less than perfect financial records or revenue history. That means it might be easier to meet the requirements for a line of credit, but the cost could be far higher than a traditional business loan. What Are Your Options for a Business Line of Credit?Many lenders, both conventional and online, offer qualified businesses access to lines of credit when they need financing. Companies like F﻿﻿undbo﻿﻿x, StreetShares, and O﻿﻿nDec﻿﻿k all offer short-term lines of credit for businesses, ranging from $1,000 up to $100,000. Traditional banks and credit unions may also offer long-term business lines of credit for the most qualified applicants, and in some cases, with higher credit lines. Businesses typically need at least six months in operations to qualify for an online credit line lender, and two years for a bank or credit union lender. When evaluating business line of credit lenders, pay attention to the cost of borrowing combined with the repayment term. Interest rates range from 9 percent to 40 percent, with the latter having a substantial impact on the total cost of borrowing. Repayment terms may range from three months up to three years, depending on the size of the credit line and the needs of the business. Be sure to ask the lender these specifics before signing on the dotted line. This ensures the credit line won’t be more burdensome in terms of cost and repayment than it is beneficial. A Business Line of Credit vs. a Business Credit CardAlthough it might sound like a business line of credit and a business credit card are one in the same, there are subtle differences that should be recognized. Lines of credit can be offered as secured, meaning backed by collateral, or unsecured, while business credit cards are almost always unsecured. Because of this difference, interest rates on business credit cards are typically higher than comparable lines of credit. Also, business lines of credit do not typically offer rewards or incentives like business credit cards might. Business owners who want lower-cost financing might look to lines of credit first, especially when the need for funds is substantial. Alternatively, business credit cards are better used for business owners who want to maximize their spending each month via rewards programs, or when financing needs are relatively small. How To Stay Incredibly Organized When Giving Gifts this Holiday Season - The Posh Life! With all the joys that the season has to offer, watching your friends and family’s faces light up when they open up a gift from you has to be one of the greatest. If only everything leading up to that moment could be as merry. Between coming up with gift ideas, creating a budget, shopping, and hoping it all arrives on time, giving gifts can be stressful. Luckily, all it takes is a little extra planning to be incredibly organized when tackling your list this holiday season. And coffee. All the coffee. Give yourself the gift of peace of mind with these seven clever tips courtesy of MakeSpace, the most convenient alternative to self-storage units in Manhattan (and the rest of NYC), Chicago, Los Angeles, and the greater Washington, DC area. Decide how many people you’ll be giving gifts to so you can avoid a never-ending list or accidentally leaving someone out. Write down any family members, close friends, and colleagues or acquaintances you’d like to buy something for this year. After you’ve got this list set, stick to it. If someone unexpectedly gives you a gift, a genuine thank you note is cool. You are not required to purchase them something in return. Holiday shopping doesn’t only have to occur during the holiday season. Avoid overspending and overstressing by keeping an eye out for gifts year-round. See something in April that you think your older brother would like? Buy it then and keep it in a good hiding spot. Come December, you will have avoided crowded malls and hectic stores. You’ll have time to add any finishing touches and actually enjoy the season rather than stress about how many shopping days you have left. Your gift list is not getting away from you this year. 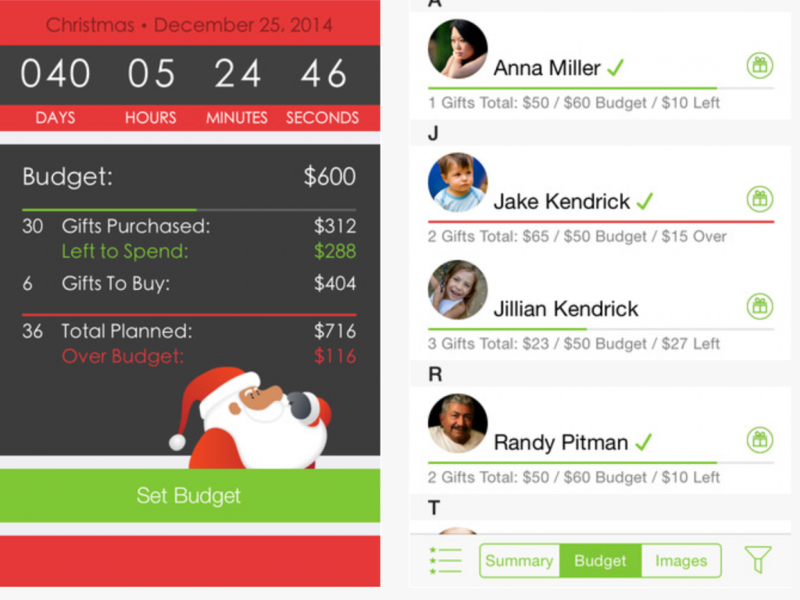 Track your budget, gift ideas, what you bought, how much you spent, and if it's wrapped yet. Organized Living recommends keeping all the information in a spreadsheet. This way, you’ll know how many more gifts you still need to buy and for whom. Plus, you can save the info for next year so that you don’t give duplicate presents. Of course, there’s an app for that, too. With Santa’s Bag, you can plan gifts for each of your recipients, then set and track a budget for them and the whole season. Has your gifting list gotten out of control over the years? See if your family and friends are interested in a group gift exchange. Whether you choose names out of a hat, assign recipients, or let people choose who they’d like to purchase a gift for, a group gift exchange is a fun way to switch things up. Plus, with less time spent shopping for multiple people, you’ll get to slow down and appreciate your time with them instead. If you’re planning to give small gifts to teachers, the mailman, and your favorite barista, make life easy and give them all the same thing. Bake a huge batch of cookies. Craft DIY ornaments. Buy small gifts in bulk, and hand them out to all of the people who make your life better. Giving the same gift to them all will show your gratitude without having to buy a different item for each person. It’s hard to keep track of the whereabouts of everyone on your holiday card list. Your friend from college moved twice in the past three years. Your boyfriend’s fun uncle travels for a living. Your sister just began her three-year neurology residency in Chicago. You’re not sure whose address belongs to who or if any of them are accurate. This year, when holiday cards arrive, take a minute to update your address book. Keep each envelope long enough to jot down the return address and any other important information. Once that’s done, recycle the envelopes (you don’t need the excess clutter). And now you’re ready for another year of mailing birthday cards and engagement gifts! A designated gift wrapping station will keep all of your ribbons, tags, boxes, and bags stored and organized until you’re ready to tie bows. Storage cubbies, like the Like-It Modular Drawers from The Container Store, will keep your decorative accessories in one easy-access spot. One cubby can hold tags, one can hold ribbons, another can hold gift bags, and one more can keep tissue paper neatly folded. We also recommend hanging gift wrap organizers over a door to maximize space while eliminating clutter on the floor. Never again will a slightly-too-small piece of wrapping paper go to waste simply because there was no place to store it. Once the perfect little gift comes around and needs to be wrapped, you’ll know where to go. Fah who foraze, dah who doraze; this year, you won’t be fazed by a long list of loved ones to give gifts to. Get yourself a red coat and eat a few extra cookies with milk: these organization tips will give the man in the red suit a run for his Bitcoin. Is taking an existing logo, changing the font and swapping colors rebranding? Not by a long shot. Does it do anything to communicate the essence of your business to prospectives? Did it generate the emotional appeal necessary to move your target audience. Did it articulate why you are unique from your competitors? The reality is that many small business owners equate their “logo” with their “brand.” This misconception is reinforced by graphic designers who advertise “branding” when in actuality they are designing a logo, letterhead and matching business cards. I’m not dismissing appealing logo work or the role it can play in identifying a company. But let’s be clear: If it doesn’t involve strategy, messaging, emotional appeal AND visual identity—then it’s not branding. Period.. A “brand” is an identifying mark. If you’re lucky (and spend a lot of money on marketing and advertising), a logo may one day come to represent your brand and be instantly identifiable. Think Nike swoosh, McDonald’s golden arches. But your logo is not your brand. In fact, many companies do just fine without any logo whatsoever. So what is your brand? Most simply, it’s your promise to your customers. It’s the combination of visual, verbal and emotional attributes that define your company and distinguish it from the competition. And it should be consistent everywhere. Sales pitches. Magazine and newspaper ads. Website. Billboard. Truck signage. Everything!